If you’d like to know how to line one of your billion baskets you have cluttering up your house, you’re in the right spot. 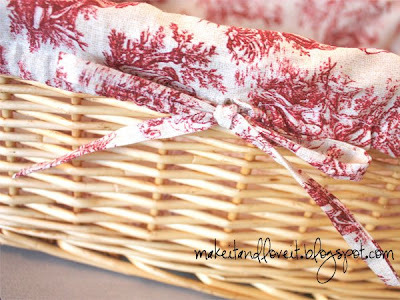 Now seriously, you can tie together a whole bunch of random baskets by lining them with matching fabric. It’s quite a beautiful thing. All you’ll need is some fabric, a sewing machine, and some thread. Oh, and square rectangle basket. First, you’ll measure from how far down you’d like the liner to go over one edge (I did 2 inches), up to the top, down the side, across the bottom, up the other side to the top and then over 2 inches or however far you’d like it to go. Then you’ll add another 1 1/2 inches for your casing for the tie. For example, mine measured 26 inches from one side, up and over and down and back up and over again. Then I added another 1 1/2 inches onto both sides for the casing to make it 29 inches. Then measure the width of your inner basket. Mine was 15 inches wide. Add 1/2 inch onto both ends for a seam allowance…….which made mine 16 inches. So I cut out my main piece at 29 x 16 inches. Then measure the dimensions of the ends of your basket. The width of my ends were 10 inches and I added a 1/2 inch on each side for a seam allowance, making it 11 inches. And the height of my ends are 6 inches. So I added a half inch to the bottom for the seam allowance, 2 inches to the top to be folded over the edge, and then another 1 1/2 inches to make the casing for the tie. So I cut 2 end pieces that are 11 x 10 inches. Then I found the center of my main piece (on the 29 inch side) and marked it with a pin. And then I found the center of one of the end pieces (on the 11 inch side) and put the two pieces of fabric together, with right sides together. Then I pinned all along the 11 inch side (the width of the basket end) until the corners. Sew into place. Then do a zig-zag stitch right next to your main stitch, to help keep everything secure and in place. Now, trim any excess/uneven edges. Now find the center of one side (of the long sides) and make a cut 2 1/2 inches up. Zig-zag stitch both of these raw edges. Then fold over and pin. Now fold over the entire upper edge a 1/2 inch and then another 1 inch to make your casing. Sew close to the first fold, securing your casing into place. Now you’ll make a tie by cutting out a piece of fabric that is 1 1/2 inches wide by however long your basket is around at the upper edge. Also, make it long enough to be able to tie a bow. I made mine 70 inches long so I cut out a piece of fabric that was 70 x 1 1/2 inches. First fold your end in 1/4 inch and then fold each side in towards the middle (iron in place if needed)…..
…….and then fold this in half. Then sew into place, close to the folds. Then thread your tie through your casing, place your lining in your basket and make a bow with your tie ends. Add magazines, books, shoes, toys, etc. Use up all of those mis-matchy baskets and liven up your place a bit. « Another sponsor and GIVEAWAY……what a beautiful thing! Love the finished product – beautiful fabric. Thank you for such a great tutorial! I have weird shaped baskets that will be darling now. I am so featuring this! Oh this is fabulous! I can’t wait to give this a shot. I’ll be linking! Thanks for sharing that! I love the baskets like that in the store, I never thought to make them myself! And you can get so many great baskets at garage sales and Goodwill! I’ll be trying this for sure! This looks professional. Great job. I LOVE THIS!!! You never cease to amaze me! This is fab! I can’t wait to try it out. Thank you for sharing your tutorial. Thanks for the tutorial! I shared this on my blog! 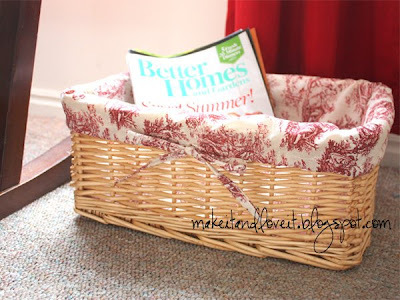 Thank you so much for this tutorial i have lots of baskets that need sprucing up. thanks for this great project info! always love the baskets , now I will try them myself.. I love your tutorial and finished product. My daughter just called and wanted me to make her some wicker basket liners so this is perfect. I can't wait to get started! Easy and simple and the results are fabulous. The only thing that I changed was instead of using fabric for the entire tie, I used elastic for 3/4s of the tie inside the casing. This makes it easier to take the liner off the basket for washing without untying. Thanks for the detailed directions! I have been looking for something to line my wicker baskets but never thought to make them myself, i suppose i should :) thank you! I need someone else to make these for me PLEASE? Can you help? I need 14! I’m trying to follow this tutorial now and it seems steps are missing?? or I am just confused. What do I do with the second smaller piece you had me cut out? you only mention what to do with one of them? This is my first project after years of not sewing. It went pretty well. It would have helped to see the other side of the corner sewing. Yours looks so perfect and mine was kinda of lumpy. I’m not going for perfect or I’d never get started. Thanks for putting this up. I would have thought this was impossible before. Do you do work for other people? I don’t sew. I need a basket lined for a baby gift. I am happy to send you the basket and fabric and whatever you might need. If you don’t do this, do you know of someone who might? I am in California. Hi, Could you help me figure out how to make this work for an oval shape basket?